Villa, in the area of Ornos, next to the sea on a small beautiful sand beach, which is used only by a few neighbours (three more villas) because of its unique location. The total indoor area of the villa is 220sq.m in two levels of 110sq.m each and moreover there is an independent guest house of 100sq.m fully equipped and furnished with its own private entrance. There is one large living room with open plan kitchen, 2 bedrooms 1 bathroom and beautiful view. The upper level of the villa has a big sitting area with fire place and built-in sofas apart from the furniture, dining area, WC, and an open-plan kitchen. The interior design in Mykonian style is of very good taste. 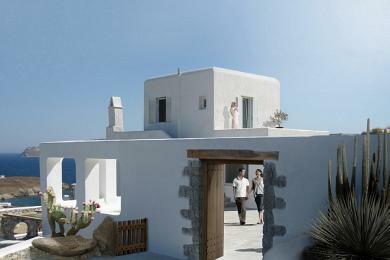 Very big verandah with fantastic unobstructed panoramic view to the Aegean Sea and its islands. The verandah is covered with pergola and has built-in benches, armchairs and an outdoor dining table. The lower level has a very big master bedroom with its bathroom and other three bedrooms with one bathroom and storage rooms. Big swimming pool and beautiful garden. 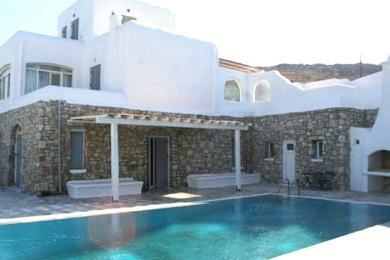 The pool is also used by the two neighbouring villas. Open parking, and covered garage 20sq.m. 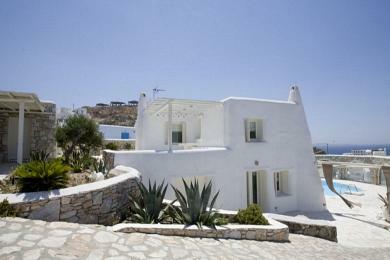 Fantastic view to the pool, to the beach and to the Agean Sea.